October 22 is National Pit Bull Awareness Day, and events will be taking place in San Diego and across the USA to raise awareness about pit bull type dogs. Once celebrated as a great all-American pet, pit bull type dogs started getting a bad rap in the 1980s, largely due to misinformation, which spawned prejudice. Fast forward to today, and pit bulls are now the most abused, most maligned and most abandoned type of dog in the United States, with approximately 1,000,000 put to sleep in shelters yearly. * Pit bulls are just dogs (a type of dog, not a breed). * They do not have locking jaws. * They do not bite differently than other large breeds. * They are not more aggressive than other breeds (source: American Temperament Test Society). Like all dogs, they feel pain, love, fear and joy. 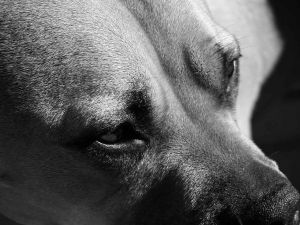 The media has played a large role in spreading erroneous information and creating hysteria about pit bulls: National Pit Bull Awareness Day is a chance to for the media to help set the record straight. National Pit Bull Awareness Day is the perfect opportunity to tell a positive story about America’s dog Pit bulls are the most abused, most euthanised, most maligned and most misunderstood type of dog in America and across much of the world today. The media has been a big part of this problem—sensationalizing negative pit bull stories, spreading myths and inciting hysteria. Now, you can also be part of the solution. October 22, 2011, is National Pit Bull Awareness Day. 1. Pit bulls are therapy dogs, service dogs, search and rescue dogs and, most famously, loving family pets (including pets to many celebrities). Tell the story of one such everyday hero in your community. We’ll be happy to help provide contacts and leads. 2. Highlight a National Pit Bull Awareness Day event going on in your community. 3. Take the opportunity to dispel many of the common myths: Pit bulls do not have locking jaws, do night bite differently than other large breeds, do not “suddenly snap,” are not “bred to fight” (the vast majority are bred as pets, like any other dog), and they do feel pain. Like all prejudicial thinking, judging a dog simply by how it looks only leads to negative actions and reactions. Understanding that certain myths created about particular breeds can lead to innocent dogs losing their lives is something that, happily, many thousands of people have been able to grasp since the Worldwide web has been able to educate. However, there are still politicians who need to learn. Hopefully National Pit Bull Awareness day will have a positive impact on the minds of those who are happy to see certain dogs lose their lives having never done a single thing wrong. know dog is a bad dog in my oppionion just bad ownership there are a lot of people out there that should not have a dog put the owner of the dog down enough said. My neigbors have a pit bull. She barks at me every time I go into my back yard & before they started to put her on a cable, she would run at me & came close to biting me twice & once grabbed my boyfriends pant leg. We have never done anything to her. There is no fence between their place & mine. She gets along fine with everyone, that comes to there place, even the little children & bigger children, that live there. I have a female dog, that is kept in a fenced area, but will bark at the Pitbull, when ever I am outside & the Pitbull starts barking. Not too long ago, “pit bull” was only meant as the nickname for a BREED of dog: the American pit bull terrier (and its doppelganger, the American Staffordshire terrier). The REAL pit bull is getting lost is some well meaning attempts to normalize the dog.